Telerik Watch: Q1 secrets revealed! Telerik Learning Guide - you asked for better documentation/tutorials and now you have it! With over 600 pages, this material sets a new benchmark in the .NET component vendor space. RadScheduler - it's finally confirmed! Telerik is hard at work on RadScheduler as part of "Prometheus" and you can expect to see more details in the coming months. 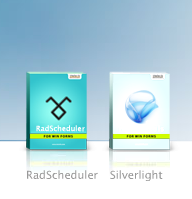 RadControls for Silverlight - leading the way on Silverlight development, we revealed today that we are working on RadControls for Silverlight (formerly WPF/e). Watch for more details at Mix 2007! Expect a flood of blog posts over the next few days as I highlight some of the new controls and share more details about the revealed secrets. This is an exciting time and I can't wait until everyone gets to download these bits on Monday! Was the game worth the wait? P.S. If you don't see the reveal, try clearing your cache and reloading the Quest page. What kind of controls will you be making for Silverlight? Input controls? There really aren't any more details about the Silverlight controls at this time. Watch for some demos during Mix 2007 in about 12 days. More will be revealed at that time.